I’m struggling with what I believe is an epidemic in education- chasing the evolution of technology. 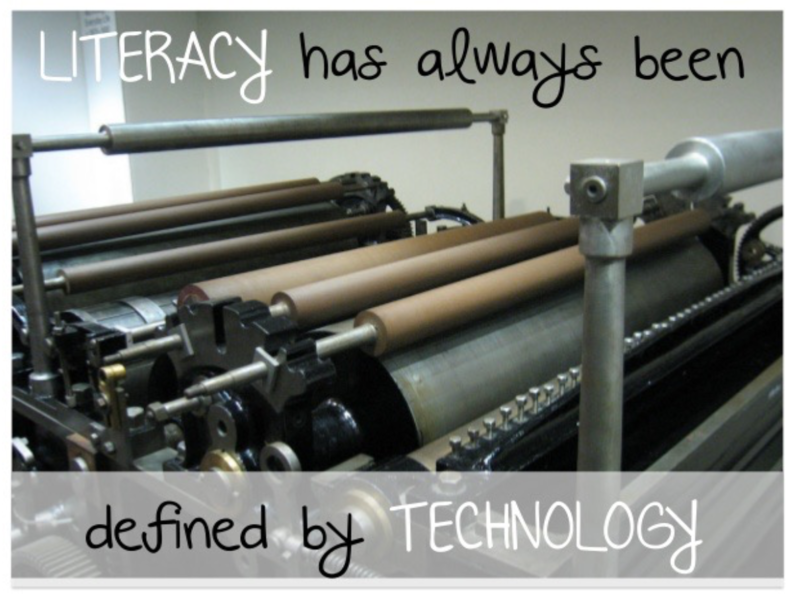 Literacy has always been defined by technology. And as such, if technology defines the context in which we learn, socialize and experience the world, we have to continue moving forward, or fear being left behind… or even worse, not providing our students with what they need to be successful now, and in the future. But, as technology continues to develop at an exponential rate, we are forever being dragged along behind our changing times- trying to keep up and catch up to what’s new -and what’s next… but should we? How do we find that balance? What compounds this issue is that we are bound by the funding allocated during each given school year to invest in initiatives that we believe will move learning forward. However, classroom teachers have become increasingly more aware of the initiative ‘shelf-life’ that carries a June expiration date. What I’ve realized as a result of countless conversations with teachers is that these kind of experiences have conditioned us to start over every year with something new, regardless of where we were at in our learning the year before. June signifies the end… as opposed to a pause, with a focus on moving forward into September. So what are the implications for us? and for our students? Repeating these kinds of experiences year after year is not only leaving teachers and students feeling exhausted and burnt out, but we are perpetuating a generalist skill set without ever really mastering anything… . Maybe some would argue this isn’t necessarily a bad thing? If we compare the idea of integrating new technologies to that of teaching a new grade, the first experience you have is all about getting your feet wet, dipping your toes into the pool where you will eventually swim as you become more comfortable with the curriculum, the relationships you have with your students and your colleagues, and the experience of learning something new. But if we were asked to change grades every year we would never leave the shallow end. Is this not true for the integration of technology as well? If we are always looking ahead to ‘what’s new’, and continuously starting over year after year, might we -on some level- be committing ourselves to a more shallow implementation of technology-integration? I understand that this posts generalizes the experience teachers have year and year, and it’s not the case for everyone. And I also recognize the need to change -and embrace it myself. However, I feel there is an urgent need for us as educators to better understand the “WHY” of our choices when integrating technology. I also believe we need to better understand “HOW” these kinds of tech-integrated experiences will benefit learners in our system now, and in the future. I have always been a firm believer in integrating technologies into classroom programs that are being using in the “real-world”. By doing so, we are recognizing and valuing the experiences our students have outside our system, while at the same time making informed decisions about the kinds of tech-integrated experiences our students need to be successful within our system. This “one-life” approach to technology integration allows us to build bridges between home and school, while helping students develop the necessary skills to be safe, productive, contributing digital citizens, guided by our knowledge of effective pedagogies. It’s not about ‘what’s new’. It’s about WHY, and IF new is better, and HOW it contributes to a better educational experience for learners. 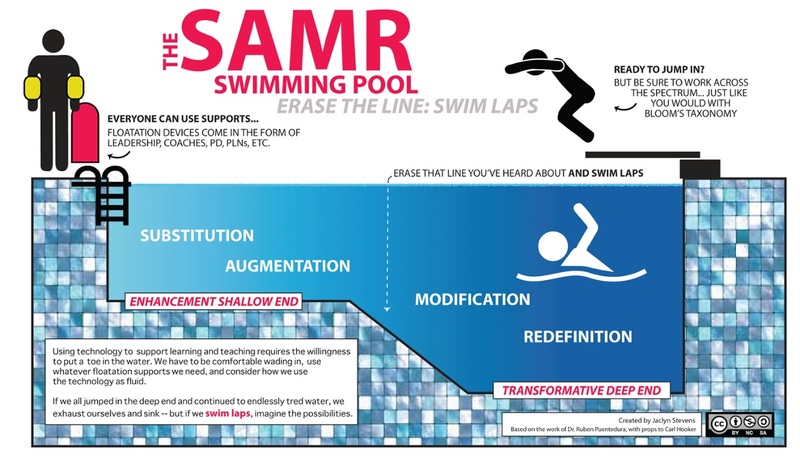 If our focus is on leveraging digital technologies to develop 21st Century Competencies, and create a culture of innovation, risk-taking, and continuous learning, it would stand to reason that we need to provide students with an educational experience based on continuity, so when they decide to dive into the deep end, they know how to swim. Thanks so much for your realistic viewpoint on how some of us feel, for sure, in the classroom. There is a distinct difference about integrating tech for the purpose for incorporating tech (mere substitution) but ideally the integration of technology is to promote the 4’s and a P in innovate ways…hence relating to the SAMR model. I think many people fear technology because they assume it replaces the lessons they may be accustomed to? Is this a comfort zone issue? Fixed mindset? Perhaps that is too large of an assumption? We have been thrown so many new methods (for so many areas of education ie. instructional methods, learning methods, assessment methods, data collection, digital portfolios, etc), either from our own PD or top down approach. We aren’t necessarily comfortable in any area and the learning curve is steep for each new initiative. Not to mention, if it is not accepted as the whole school or as a division, we are facing many of these new initiatives independently and not sure who to turn to for support. This is leading to teacher burn out, feelings of inferiorty, competition between staff about incorporating the most innovative methods and constantly playing catch up. I don’t know what the right answer is but ideally we need to be more conscientious of why we are incorporating technology and how to do so effectively to better the learning experience. I completely agree with both of you. As a grade 1 teacher I often struggle with these same thoughts. The saying ” Less is more” is usually how I deal with this struggle. I find that my students love to learn the new technologies but I believe that if we want them to be successful with technology, they need time to learn how to be successful with it so they are not ‘drowning’ when they are asked to use it to show their critical thinking. It is hard to feel successful when so many new technologies are being used or focused on by others- sometimes it feels like I am being left behind, until I see my students being successful with the technology I have chosen to focus on. Student success has to come first.